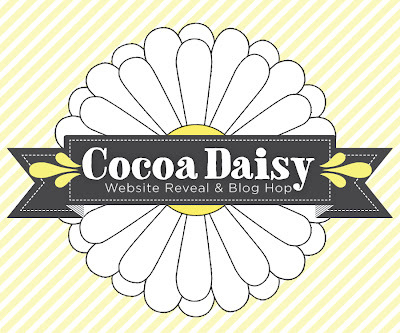 i'm so proud to be a part of cocoa daisy! christine is so kind and encouraging. and she has worked so hard to make cocoa daisy the company she knows it can be. for much of the last year, she's been working on her website remodel, updating nearly everything to make it easily navigable and user friendly. i'm happy to be a part of the blog hop introducing the new site! To help celebrate, we are doing a blog hop and giveaway. Just leave a comment on my blog to be entered to win a set of all FOUR of this month's exclusive, sold out, Cocoa Daisy Stamps. Love your card! 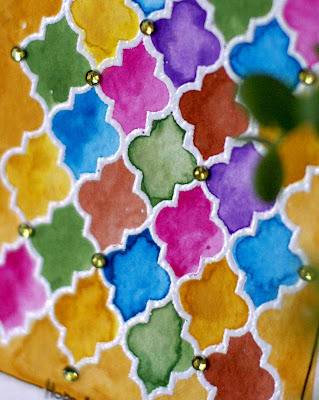 Beautiful watercolors. What a clever way to use that stamp Emily! I'm going to have to pull out my water colour paints, thanks to you! beautiful card..the colours are so yummy! Oh I love your card! Its beautiful! Oh wow I am so inspired by this! The colors are so beautiful! Just love the card. I'm going to have a play with my stamp. Guess I can blow the dust off my watercolors now! Great card! Your card is beautiful Emily! And I love the simplicity of the sketch! OOOh! pretty pretty pretty! I think today I'll spend the whole day making cards inspired by this blog hop! 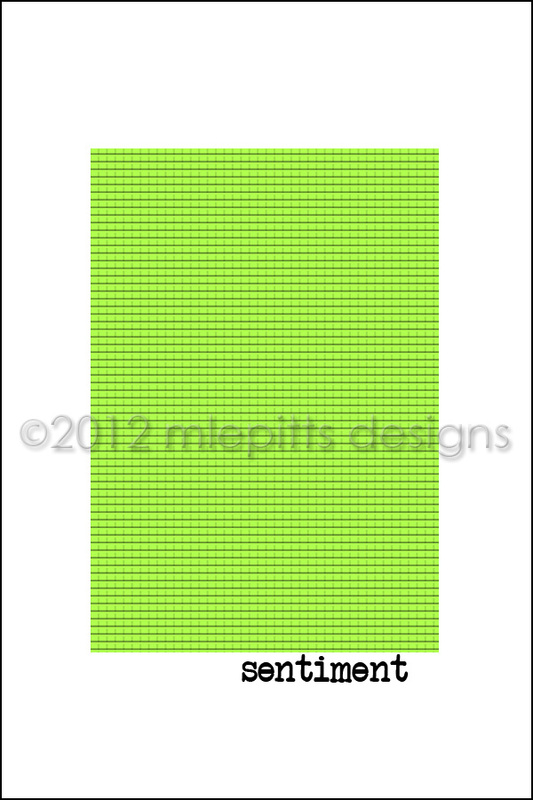 love the bright colours on your card. thanks for the chance to win this fantastic prize. Like the simplicity and clean look... very cool... thanks for the chance o win! Love this! The stamp is awesome and the watercolor effect is great! I love the water color effect. Great job. Okay - trying for the third time - Google Blogger won't let me in - - back to my comment! I LIKE - so colorful! I love!!! this card It is one I will definitely make a version of. Beautiful! Thanks for being a part of this blog hop emily, a lot of fun! Beautiful painting- I love that it looks like stained glass. Beautiful card. The Watercolors are perfect. Thanks for the chance to win. Love your cards - so eye catching. Nice stamp! I like how you used a lot of products to make it your own. What a great card... The colors just pop. Love the mosaic feel of your piece! how awesome is your card. I love that stamp. I love how you colored it in. great idea. I hope to get some craft time this weekend...all these wonderful card sketches are inspirational. 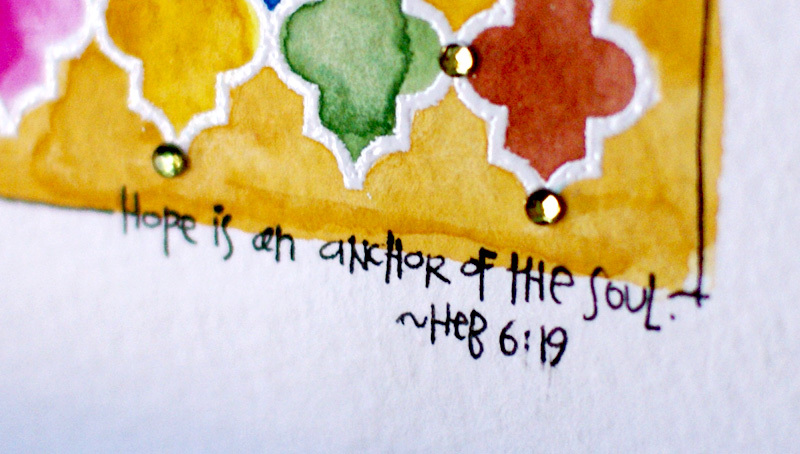 Love how you used the stamp and the verse is beautiful. Can't wait to get my kit and stamps this month. I have had "I am not of this world" bouncing around in my head for weeks especially when I encounter the ugliness and overindulgences of this world. This past Sunday our scripture lesson was John 17. John 17:13-19 really resonated with me. It is amazing how God heard my heart and then let me know he was listening He is amazing like that. Beautiful image and sentiment! I love the gems - they really work with the stained glass look! thanks so much for sharing!!!! rgauss at sbcglobal dot net. Beautiful card! Thanks so much for the inspiration and the chance to win! What a total inspiration! And it reminds me of all the cathedrals in Germany I visited. Thank you! Such beautiful colors. Love the stamp you used. Love how you used the stamp. Thanks for the chance to win! I love peeps who color outside the lines ...... !!!!! Got my kit on Tuesday and I am looking forward to diving in to it soon! Beautiful card I love watercolors! Love the beautiful colors and that stamp is gorgeous! Thanks for the chance to win! I love the new website! That is a beutiful card, and I love that scripture passage! Thanks for the giveaway! Love this beautiful card. Can't decide if it is more like a quilt or stained glass window. Love it. Love your card! Might have to get out my watercolors and give it a try! Love, love , love your card. So inspired by it. I'm off to go raid my kids watercolor sets. Thanks for the chance to win! I love the March kit, thanks so much for the chance to win! I love the stamp also. Beautiful colors. Gorgeous card! I may have to do some watercolors today. Thanks for the inspiration and chance to win. What a beautiful card! I absolutely love the vivid colors. Beautiful card. Love the scripture too. Would love to get the sold out stamps. I could put one of those cute stamp sets to good use. These stamps are AWESOME and so is your card! Thank you so much for the chance to win! I'm an avid card maker, and would LOVE the chance to win those stamp sets!! you are rockin' that stamp! Love the quote idea on a card! Great card! I love watercolors. What a lovely card. So out of the ordinary. this is beyond gorgeous! i'm so stealing this idea! Wow! What a lovely card. I will be following your blog from now on! 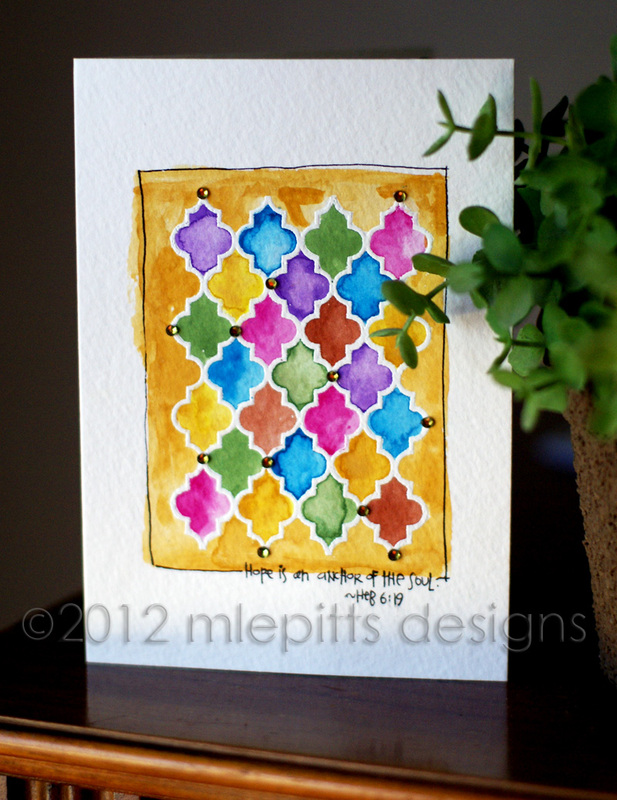 I just love the quatrefoil pattern! I didn't know cocoa Daisy offered stamps too. Thanks for the chance to win! That is one awesome technique super love! I absolutely love your card! I would feel extra loved if I received that in the mail! Thanks for sharing your inspiration. I love your gorgeous stamped and painted card! What a beautiful card!! Love your blog! Love the take on heb. 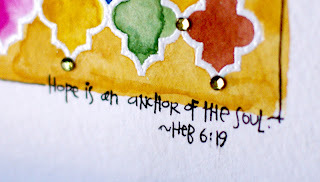 6:19...never been to your blog before and your profile made me smile...we sound like kindred spirits! I love the painting and embossing!! I love Cocoa Daisy! What a wonderful giveaway! Ooh! the water colors are so pretty! Thanks for sharing and for the chance to win!! I love your card. Thanks for sharing! Lovely card. Those colors make me want to run in my craft room and start painting. Beautiful card, love the watercolor effect and can only imagine how beautiful the window was that inspired it. Oh that quatrefoil shape is showing up everywhere!! Love it. My dd is decorating her new apt. with this particular shape in mind. So pretty with all those bright spring colors. Just what we all need right now. Love the quatrefoil shape and how you presented it. Love the card, so creative! I love the card. So happy I did order this stamp!! Got it last week with the rest of my goodies! 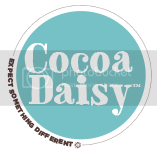 Christine has done an awesome job with Cocoa Daisy!!! Watercolor - may favorite! thanks for the chance to win! Show-stopping! Those colors really grab your attention! I am inspried by the watercolor effect. Thank you for sharing. Your card is beautiful, very inspirational! Looks like stained glass. Very pretty! Such a pretty card -- like stained glass. Love your blog -- this is the first visit, but will not be my last! This card is beautiful. I love how the embossing adds another layer of dimension. I love the quatrefoil stamp!!! My grandparents had a front door with this design too! Your card inspires me to drag out my Koi watercolors! Much heartfelt gratitude for your contribution to Cocoa Daisy! Love that stamp...can't wait to get the kit! Love the colors you used! Thanks for the chance! I like this card it looks like a stained glass window and I love that you've used your own handwriting. Thanks for the chance to win. Beautiful card! I like the colors! thanks for sharing and the chance to win! Fabulous, thanks for the chance to win! Wow, your card is so gorgeous and unique!! Love this colorful, graphic design! Wow Emily - I am so happy I found your site... you do beautiful work.. thanks for a chance on the giveaway..
gorgeous enough to frame and hang on the wall! Emily, this card is wonderful! Love how you used the watercolors!! Thank you for the inspiration & the chance to win! I'd love to win these sold out stamps! Just checked out the lovely job Christina did remodeling the site - from the new homepage to how easy it is now to find tips, topics and sneaks, looks great! Thanks for brightenng my weekend! Always amazing stuff here, Emily, from techniques, to ideas, to unending inspiration. Love the stamps... but what you did with them is amazing!!!! Beautiful colors! What a great idea! I love the look and use of watercolors! First visit to your blog and I love your style. The watercolors are inspiring me? Did you use watercolor paper for the card? I just love how you used the stamp! I have just started using stamps on my layout, loving them. Thanks for the chance to win! Gorgeous card, the water coloring is really a great way to use this stamp! I love the watercolour background that you created with this stamp set. That is such a great idea. So inspired now by your project! Gorgeous!!! You should definitely frame it. lovely card...love the jewel tones. Such a great watercolor card. Love that you used the words of your daughter on the card. LOVE the stamp! 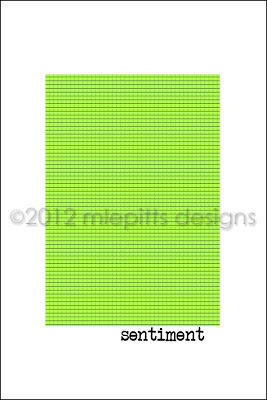 And the idea to emboss it in white & then watercolor! hi emily! here i'm to take my chance. thanks a lot. love that stamp! would love to win! thanks! love the inspiration. thanks for the opp to win. Emily your card is great! Cute card! & the technique sounds like something I need to try!